ProtoScript® II Reverse Transcriptase is a recombinant M-MuLV reverse transcriptase with reduced RNase H activity and increased thermostability. It can be used to synthesize first strand cDNA at higher temperatures than the wild type M-MuLV. The enzyme is active up to 48°C, providing higher specificity, higher yield of cDNA and more full-length cDNA product up to 12 kb. Jurkat total RNA (1 μg) was used in a 20 μl first strand cDNA synthesis. Mixtures of all reaction components, except for reverse transcriptase, were held at different temperatures for 3 min. 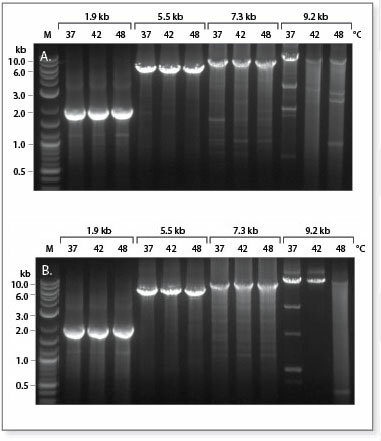 200 units SuperScript® II (A) or NEB’s ProtoScript II Reverse Transcriptase (B) was added and incubated at the indicated temperature for 50 minutes, followed by heat inactivation for 5 min at 80°C. 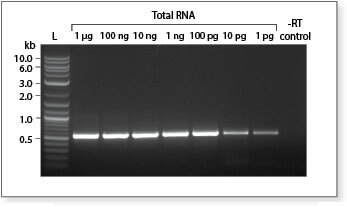 1 μl of cDNA was used in a 25 μl PCR using LongAmp Taq Master Mix (NEB #M0533) for 35–40 cycles. Ladder L is the 2 Log DNA Ladder (NEB #N0469). Jurkat total RNA (1 μg) was used in a 20 μl first strand cDNA synthesis with 200 units of NEB ProtoScript II Reverse Transcriptase. Reactions were incubated at 42°C for 50 minutes, followed by heat inactivation for 5 minutes at 80°C. 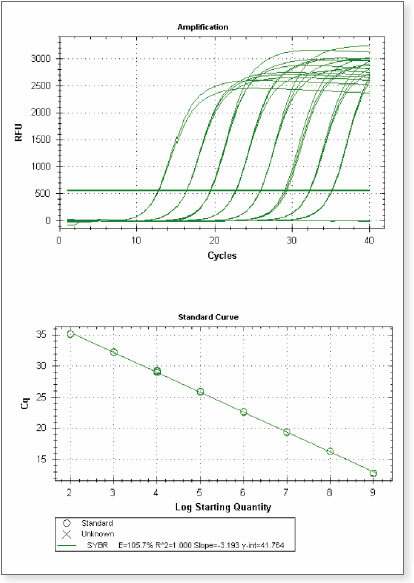 1 μl of cDNA was used in a 25 μl PCR using LongAmp Taq Master Mix (NEB #M0533) for 35–40 cycles. Sizes are indicated above gel. Decreasing amounts of Jurkat total RNA (1 μg – 1 pg) were used in 20 μl first strand cDNA synthesis with 200 units of NEB ProtoScript II Reverse Transcriptase. Reactions were incubated at 42°C for 50 minutes, followed by heat inactivation for 5 minutes at 80°C. 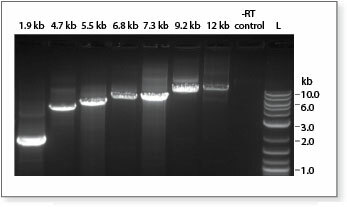 1 μl of cDNA was used in a 25 μl PCR using LongAmp Taq Master Mix (NEB #M0533) for 40 cycles. The target is a 0.6 kb fragment of GAPDH. Ladder L is the 2-Log DNA Ladder (NEB #N0469). Decreasing amounts of luciferase mRNA (109 to 102) molecules were converted into cDNA in the presence of 1 ng Jurkat total RNA using 50 units of NEB ProtoScript II Reverse Transcriptase in a total reaction volume of 20 μl. 1/20 of the cDNA product was amplified using SsoAdvanced™ SYBR® Green Supermix. As few as 5 molecules of luciferase mRNA are detectable. The gene encoding a mutant M-MuLV Reverse Transcriptase (RNase H–) is expressed in E. coli and purified to near homogeneity. One unit is defined as the amount of enzyme that will incorporate 1 nmol of dTTP into acid-insoluble material in a total reaction volume of 50 μl in 10 minutes at 37°C using poly(rA)•oligo(dT)18 as template. 50 mM Tris-HCl (pH 8.3), 75 mM KCl, 6 mM MgCl2, 10 mM dithiothreitol, 0.01% IGEPAL CA-630, 0.5 mM dTTP, 0.4 mM poly(rA)•oligo(dT)18. 1X ProtoScript II Reverse Transcriptase Reaction Buffer, 10 mM DTT, 200 units ProtoScript II Reverse Transcriptase, supplemented with 0.5 mM dNTPs (not included) and 5 µM dT23VN (not included). Incubate at 42°C for 50 minutes. If random primers are used, a 10 minute incubation at room temperature is recommended before transferring to 42°C. Roth, M.J., Tanese, N. and Goff, S.P. (1985). J. Biol. Chem.. 260, 9326-9335. Kotewicz, M.L. et al, (1988). Nuc. Acids Res.. 16, 265-277. Lim, D. et al, (2006). J. Virol.. 80, 8379-8389. Sambrook, J., Fritsch, E.F. and Maniatis, T. Cold Spring Harbor: Cold Spring Harbor Laboratory Press.(Ed. ), Molecular Cloning: A Laboratory Manual. 1989, pp. 5.52-5.55, 8.11-8.17. What is the difference between NEB# M0368 and NEB# M0253? What is the optimal reaction temperature for ProtoScript II Reverse Transcriptase (M0368)? How can the yield be improved when using ProtoScript II Reverse Transcriptase? How can the length of the product generated by M-MuLV Reverse Transcriptase be increased?